I’m back! I’m happy to be back on here despite how much I enjoyed my little hiatus. I know it was abrupt, like most of my hiatus this year have been and I’m really sorry. Life just happened really fast and I decided to just pause and figure everything else out. During this small break, I took some time to think about the type of content I want to continue to create on here and I got some clarity on most of the things. Some of the things however, I’ll decide as we go along and depending on how y’all respond to the small changes that I hope to effect. Anyway, today I’ll be sharing an outfit that I’ve featured on the blog before but eventually put it down because I didn’t like the pictures. However, I enjoyed this very impromptu shoot I had a few days ago and i was just really happy that day. Lately, I’ve been reaching for the same colors over and over again- mostly reds and pinks. Also, I’ve been more inclined to lipgloss rather than lipstick. This will become more obvious in my next posts but I hope you enjoy the simplicity of this look and the pictures. 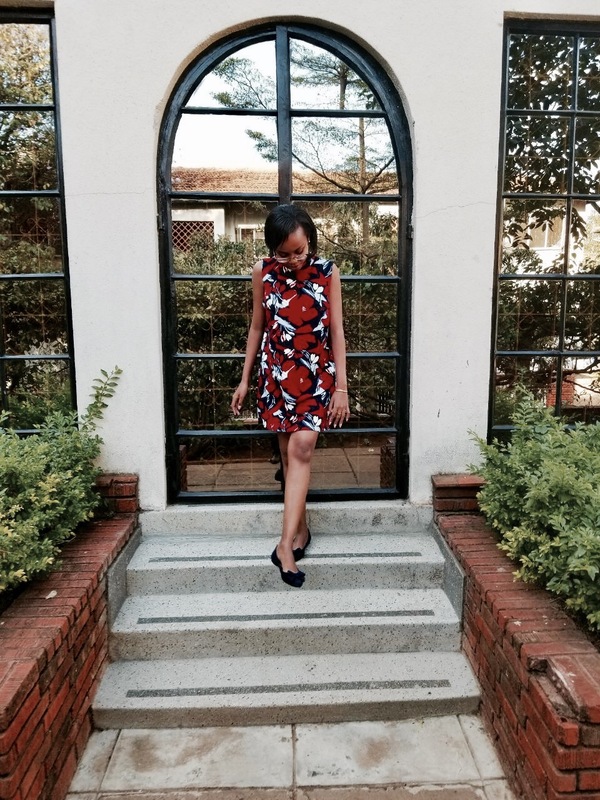 On this particular day, it was so hot, like most Nairobi days lately, and I needed something stylish and comfortable, this shift dress gave me just that. If you don’t own any of these by now, you should really consider getting one or two to start off and trust me you’ll get hooked! Maybe this floral print is not your cup of tea but you can definitely look up the different styles they come in. The t-shirt dress is the most preferred paired with a pair of white sneakers. Remember to let yourself really feel things- so when you laugh, really laugh. Feel it in the pit of your stomach. Laugh till it hurts. Let it consume you.